Mariner was one of the first females to ever pilot a tactical jet aircraft and the first woman to ever command an operational air squadron. MAYNARDVILLE, Tenn. — Captain Rosemary Mariner, a military trailblazer who lived in Anderson County, was laid to rest Saturday after a long battle with ovarian cancer. She died at the age of 65 on Jan. 24. 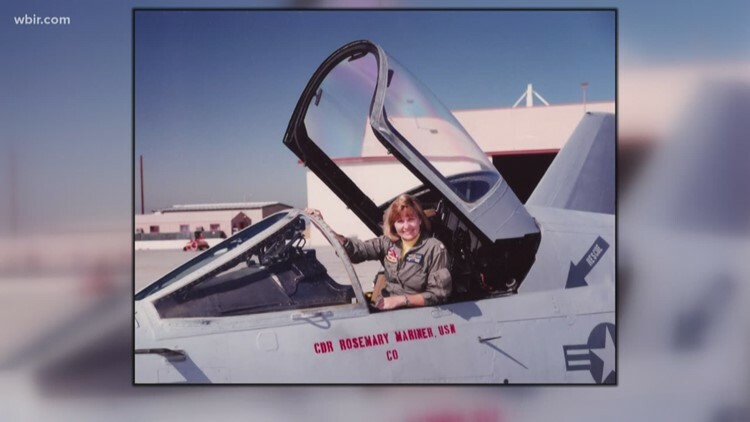 Mariner, a Texas native and Navy veteran who served her country for 24 years, held a career of historic firsts -- including being the first woman to ever command an operation air squadron and being one of the first women ever to pilot a tactical jet aircraft. During Operation Desert Storm, Mariner commanded Tactical Electronic Warfare Squadron Thirty Four. She logged nearly 3,500 flight hours in her career in more than a dozen aircraft. Mariner also lectured in Knoxville at the University of Tennessee's history department for 14 years and was a visiting fellow with the Center for the Study of War and Society. Four fighter jets flown by women offered an aerial tribute to the pioneer and legendary military leader. "She was very proud of the fact that women followed her and that she wasn't the only one to walk through that door. That legacy shows that door stayed open," her husband Tommy Mariner said. Mariner was buried at New Loyston Cemetery in Maynardville.